The "Card is Updated" business rule will trigger a predefined action (create, move, update, send a notification, call web service) whenever a card is updated. A typical example would be to move a card to a particular swimlane if its color changes to red. How to set up the Card is Updated rule? 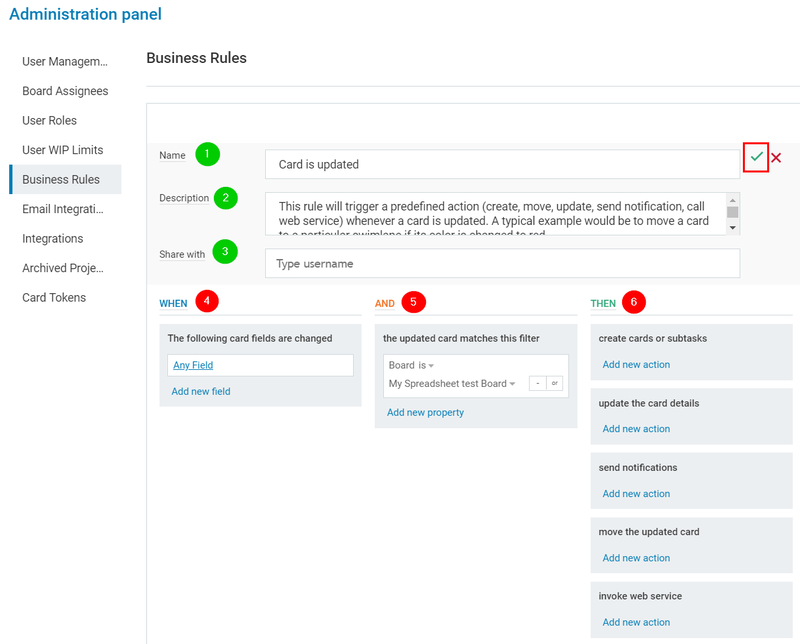 To configure the business rule, please go to the Administration panel at the top right side of your screen -> open the Business rule tab -> select the "Card is created" rule option. Note: In case that there is a set of defined rules to your account -> use the Add new rule button at the upper right side of the panel. (1) Name - give a name of the rule to distinguish it. (2) Description - provide a description of the rule behavior in the system. Note: when a business rule is created, it will get a rule ID and will be made available in the Business rule panel under name and description. (3) Share with: this option allows you to share the rule with other users in the system so that they can edit/disable/enable the rule. Every business rules have three main control settings: When; And; Then. It is a sort of "point-and-click" programming language with which you can automate any process. The way it works is based on the programming conditional statement "if this then that". To save/enable a rule click on the green checkmark at the top right corner of the configuration panel. (4). WHEN: "The following card fields are changed" - this is the event which will trigger an action. -> Click on Any Field -> Select a regular field or a custom field. For example, select a "Color" and specify it = red. As a result, the rule will trigger an action every time when a card changes its color to red. Note: You can add as many fields as you wish by clicking on Add new field and repeating the steps. (5). AND - define the filters and select the conditions under which the actions should be triggered. Select a board from the dropdown list. You can use "or" to add extra boards and optimize the scope of the rule. Use the minus sign to remove a board. Use "Add new property" to further configure the automation. 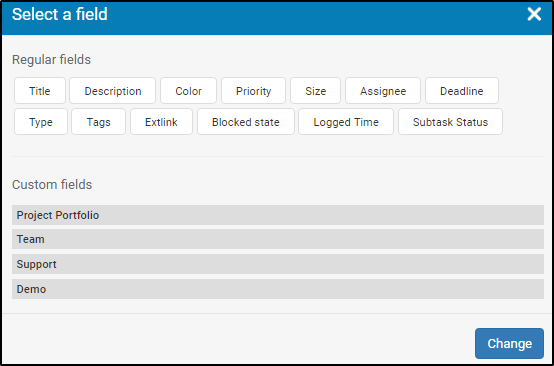 Select a regular or custom field from the panel (for example: Assignee: set it up). 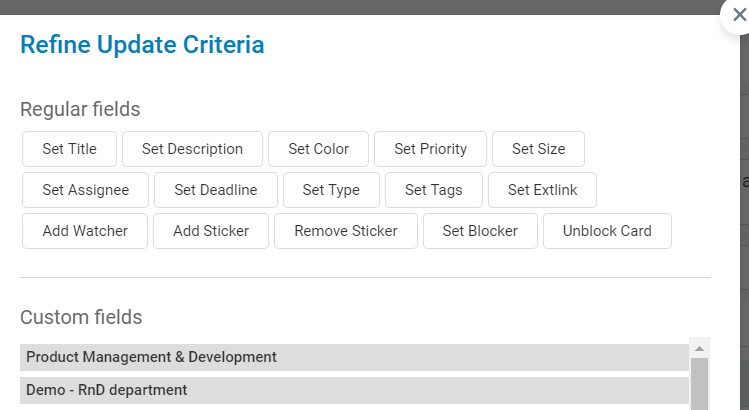 As a result, the rule will be triggered only for cards, which color is changed to red; are located at the defined board and have the assignee specifies in the rule. (6) THEN: Select an event that will happen if the created card matches your filter. 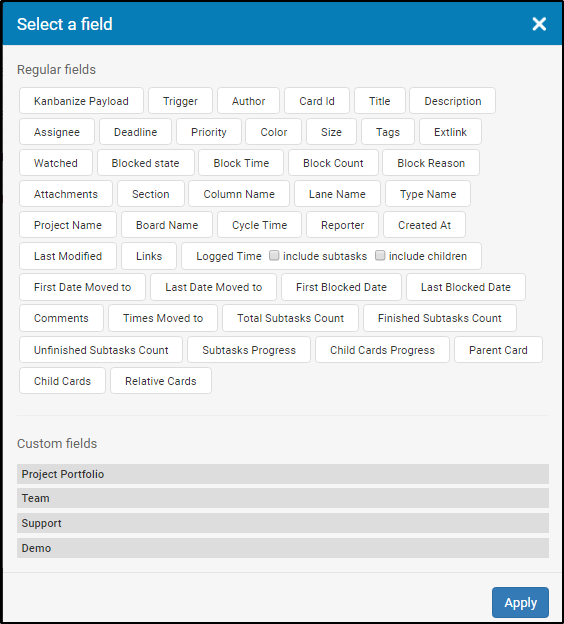 - create cards or subtasks - click on add new action and use the supporting panel to select the type of cards you want to create i.e. a new card/child card/parent/relative/subtask. When you make your choice, please define the new card/child/parent/relative/subtask position via the board minimap. - update the card details - click on add new action and update the properties that you want to update when a card is created. select any of the available options and set it up. 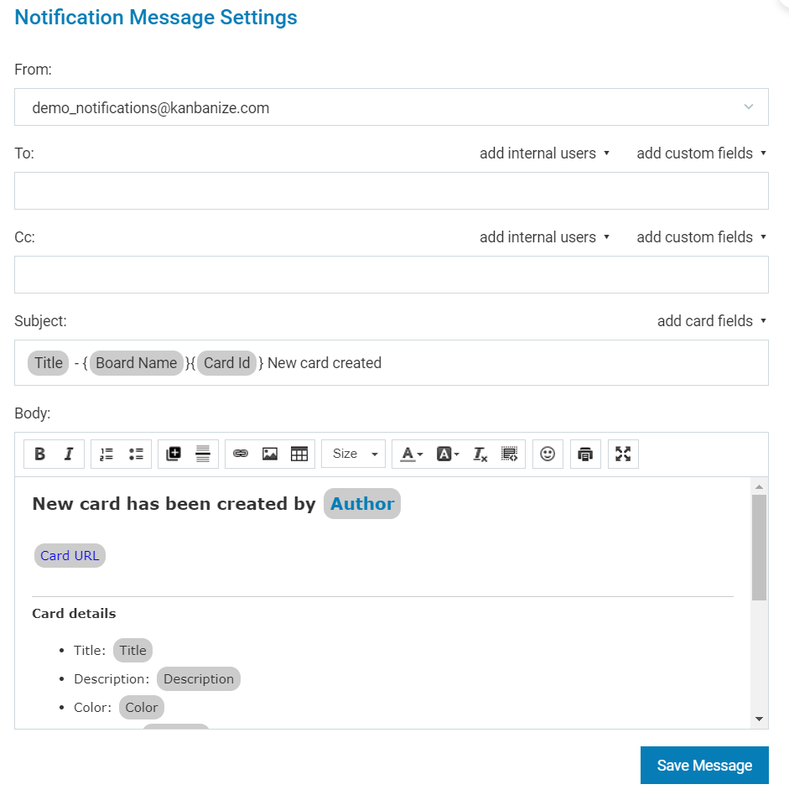 Every time when "a card is created" a user or a set of users will receive an email if you select to configure this option and create a template for the email notification, which is to be sent. In the To:/Cc: field -> use the "add internal users" dropdown which opens a list of all users in your account including: Self, Assignee, Watchers, Contributors, Reporter. - >select and add the user/s that will be notified. The "add custom field" option is used if you have a custom field with an email address and the created card contains this custom field, the notification will be sent to this email address. The Subject of the notification email contains by default: the title of the executed rule, board name, card ID and the text "New card created". You can modify the title by clicking on "add card fields"and select your preferred card properties to display. You can remove all fields and write a custom title. Email body: you can either keep the predefined text or change it according to the information you want to share with the users. - move the card - click on add new action to open the Board Minimap option and select where to move the card that has been created. -> select a Board from the dropdown list (1) and select a position (column/lane) at the board minimap (2). 5) invoke web service - click on add new action to add a call to an external web service. To configure it, select "not set" and set the parameters. 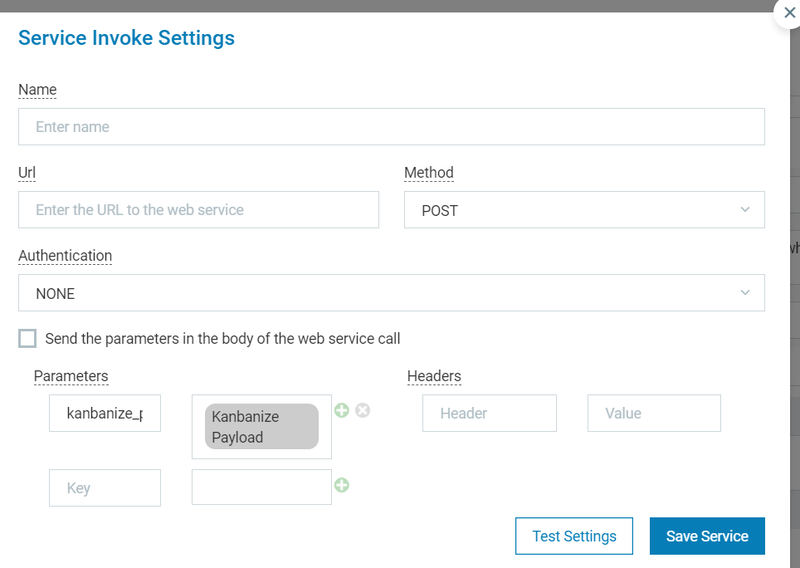 To send the parameters in the body of the web service call -> activate the checkbox. When the payload is received by the endpoint, the content of “kanbanize_payload” can be parsed and the required actions can then be performed by the external system. Click on the green plus sign to add a parameter. Select a field you wish to set as а parameter -> click on Apply. When you have configured your parameters, use the Test Settings button to send a pre-scanned request for testing and debugging purposes only. Click on Save Service to save the configuration. Check Kanbanize API documentation here.